A recent E. coli outbreak tied to romaine lettuce has many people wondering how they can avoid infection for themselves and their loved ones. The romaine lettuce outbreak has been traced back to Arizona, but it quickly spread to other states. Unfortunately, labels don’t typically say where produce was grown, so it can be hard for consumers to determine if the vegetables or fruit in their refrigerator may be a problem. If you’re concerned about your aging relative being infected with E. coli, one of the best ways you can protect them is with knowledge. 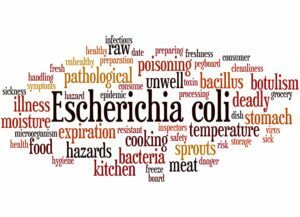 E. coli is short for Escherichia coli. It’s a kind of bacteria that is normally found in the intestines of both people and animals. There are many different strains of E. coli and most of them are aren’t harmful. However, some of them, like the strain tied to the romaine lettuce outbreak can make people sick. The most common of the bad E. coli strains is called Shiga toxin-producing E. coli (STEC). About 265,000 people are afflicted with a STEC infection each year. Most of the time, the patient recovers within around eight days. However, for people with a weakened immune system, infection can be life-threatening. Abdominal pain and cramping, which can occur suddenly. Avoid meats that are not completely cooked. Thoroughly wash all raw produce. Wash utensils and cutting boards before and after they are used with raw meat or produce. Use separate cutting boards for meats and vegetables. Senior care can help prevent your aging relative from getting E. coli by assisting them to follow food safety rules. A senior care provider can prepare meals for the older adult without assistance. However, if the person enjoys cooking, but needs a little help, a senior care provider can do the parts of the task that the older adult cannot. They can also observe the senior to ensure they are not cross-contaminating foods and surfaces. If you or an aging loved-one are considering senior care in Plano, TX, please contact the caring staff at Custom Caregivers today. Call us at (972) 702-7988. I am the Owner and Chief Caregiver at Custom Caregivers. At Custom Caregivers we provide non-medical elder care services to help seniors receive the assistance they need to remain safe and comfortable in their own homes, assisted living or retirement communities, while maintaining as much independence as possible. We have been in been business since 2003 and we have provided care to hundreds of satisfied clients in the DFW area. Many agencies have great caregivers. We have exceptional caregivers that are trained to provide custom care to our clients. What Do You Need to Know about Hearing Loss and Your Elderly Loved One?